One of the interesting things about the Great Recession was how Canada’s financial system sailed through it largely unscathed. Its banks were regulated wisely and behaved prudently, its citizens avoided the extreme stupidity of their credit-addicted neighbors to the south, and its government refrained from doubling its debt every eight years. It certainly looked like Canadians were smarter – or at least more emotionally mature – than we were. 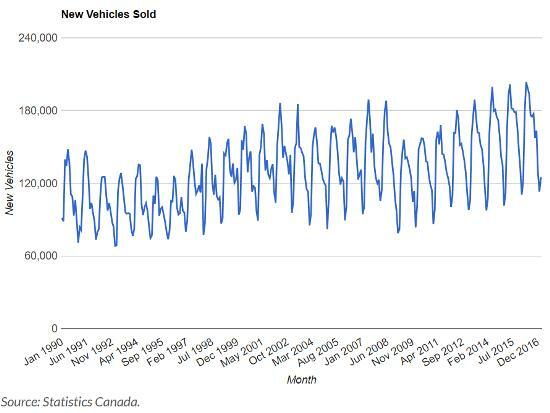 (Better Dwelling) – Sales of new motor vehicles across Canada rose to an all-time record for February. Consumers are purchasing more expensive vehicles too. Over $5 billion was spent on new vehicles for the month, bringing the average to $40,100 – up 3.4% from the same time last year. The uptick in average sale price is due to longer financing terms for buyers. 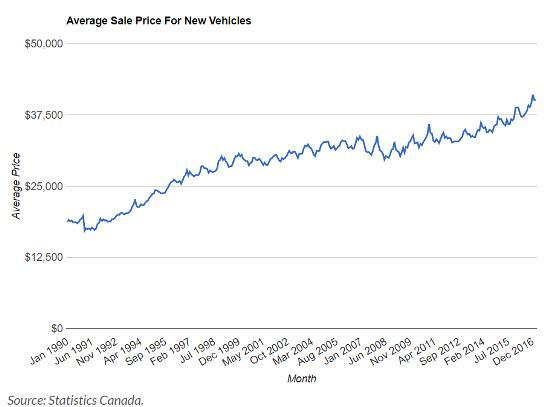 According to the Financial Consumer Agency of Canada (FCAC), Canadians are “increasingly purchasing more car that they can afford,” due to longer financing becoming fashionable. The agency notes that average leases have crept up 2 months, every year since 2010. According to the Bank of Canada (BoC), the average loan was 74 months as of 2015. Longer terms bring down monthly payments, but increases the total cost of the loan. The right to debt seems to be a topic all Canadians are embracing, and the auto sector is no different. The BoC has estimated that 25% of borrowers are non-prime, which in case you didn’t know is Canadian-English for “sub-prime.” These buyers generally have a FICO score below 670, and face predatory loans with up to 25% interest. This makes it difficult to build positive equity on car loans. (Global News) – More than half of Canadians are living within $200 per month of not being able to pay all their bills or meet their debt obligations, according to a recent Ipsos survey conducted on behalf of accounting firm MNP. (Huffington Post) – The Toronto real estate scene is nothing short of nuts, as prospective homebuyers with jobs and tens of thousands of dollars in the bank are still getting shut out the red-hot market. Many buyers are pooling their financial resources to enter the market, and co-ownership is becoming increasingly popular. Toronto realtor Lesli Gaynor, who has a background in social work, has launched GoCo, a service dedicated to helping people find homes they can afford in Toronto through co-ownership. “I sort of came to it through watching people be shut out of this market for all kinds of reasons — but mostly financial,” she told HuffPost Canada in an interview. She primarily works on helping people find others to purchase property they actually want to share and live in, though not necessarily as roommates (i.e., not sharing a bathroom and kitchen). To connect potential co-homebuyers, Gaynor held a “speed-dating” event called “C-Harmony: Creating Co-operative Connections” at a Toronto pub on Thursday. About two dozen people attended, according to the Toronto Star. “As a 35 year-old who doesn’t have $400,000 for a down payment right now, it’s increasingly unlikely I would be able to do that on my own,” he said. Buying with strangers is a feasible idea, but it just “needs to be normalized,” says Gaynor. She pointed to Meridian Credit Union’s recent creation of a friends and family mortgage, and said many lawyers are adapting to write covenants that protect both parties. Yep, this is both crazy and familiar. In one sense Canada is just the latest victim of global hot money flows. Rich people in unstable countries like China or Russia are always looking for safe places to stash what they’ve earned or stolen. And their wealth in the aggregate dwarfs the capacity of a Brazil or a Switzerland to absorb it. So when it really starts flowing it distorts the target market in ways that seem like fun for the recipients at first but eventually turn into a nightmare. Now it’s Canada’s turn, as the fortunes created during China’s post-2008 credit binge flee in anticipation of the inevitable bust. Much of that cash is flowing into Vancouver and Toronto real estate, leading to the insanity chronicled above and much, much more. Canadian homeowners find themselves becoming rich beyond their wildest dreams and spend accordingly while renters find themselves priced out of the market for shelter, devoting an ever-larger share of their income to rent and sinking deeper into financial insecurity. Those are the people who are one emergency away from bankruptcy. This divergence between the haves and have-nots begets all kinds of societal ills, from financial speculation to political upheaval. And – so far at least – the targets of hot money flows have yet to figure out a solution. The money pours in, screws everything up, then pours out, causing a crisis. If anyone deserves better, it’s our likable northern neighbors. But hot money, like the rest of life, is not fair.